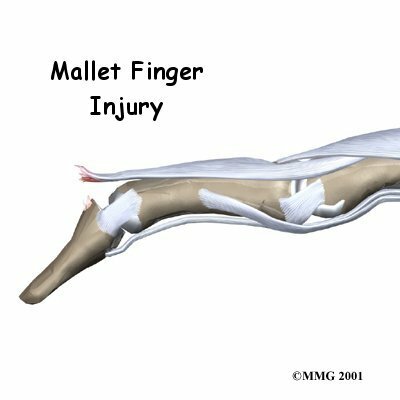 Welcome to Grapevine Physical Therapy & Sports Medicine's patient resource about Mallet Finger Injuries. What tests will my health care provider do? When you visit Grapevine Physical Therapy & Sports Medicine, our Physical Therapist will take a history and do a physical examination. 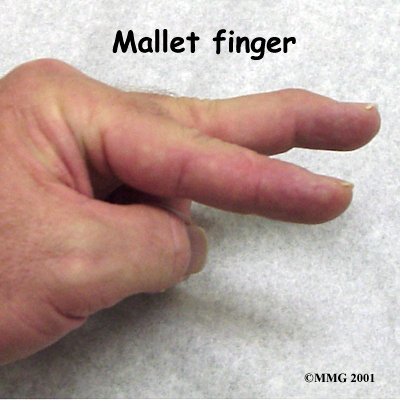 Usually the diagnosis of mallet finger is clearly evident from the physical exam. Some patients may be referred to a doctor for further diagnosis. X-rays may be required to see if there is an associated avulsion fracture since this may change the recommended treatment. No other tests are normally required. Once your diagnostic examination is complete, the Physical Therapists at Grapevine Physical Therapy & Sports Medicine have treatment options that will help speed your recovery, so that you can more quickly return to your active lifestyle. Treatment for mallet finger is usually nonsurgical. If there is no fracture, then the assumption is that the end of the tendon has been ruptured, allowing the end of the finger to droop. When you begin your Physical Therapy program, our Physical Therapist may recommend continuous splinting for approximately six weeks followed by six weeks of nighttime splinting. Usually this will result in satisfactory healing and allow the finger to extend. The key is continuous splinting for the first six weeks. 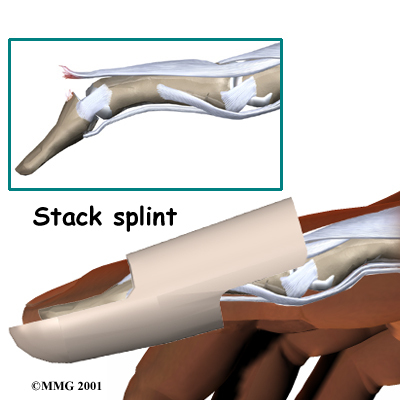 The splint holds the DIP joint in full extension and allows the ends of the tendon to move as close together as possible. As healing occurs, scar formation repairs the tendon. If the splint is removed and the finger is allowed to bend, the process is disrupted and must start all over again. The splint must remain on at all times, even in the shower. While a simple homemade splint will work, your Physical Therapist can provide you with a recommendation for the type that will be most beneficial to your recovery. There are many splints that have been designed to make it easier to wear at all times. 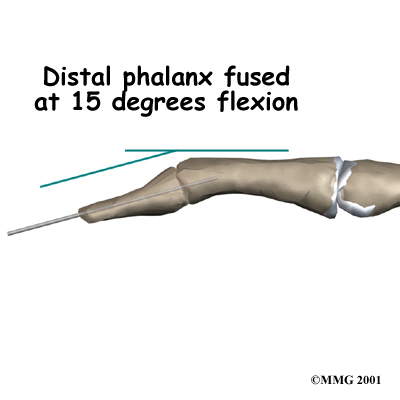 In some extreme cases where the patient has to use the hands to continue working (such as a surgeon), a metal pin can be placed inside the bone across the DIP joint to act as an internal splint allowing the patient to continue to use the hand. The pin is removed at six weeks. Splinting may even work when the injury is quite old. In this case, we will usually splint the finger for about eight to 12 weeks to see if the drooping lessens to a tolerable amount before considering surgery. When the injury is new, we may recommend that the DIP joint be splinted nonstop in full extension for six to eight weeks. 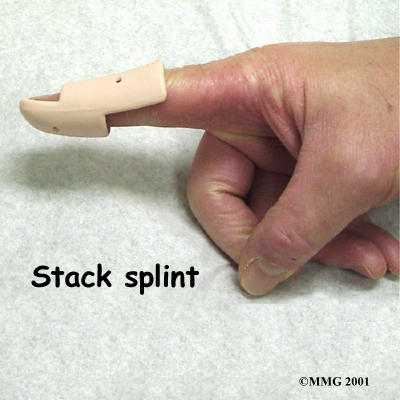 A mallet finger that is up to three months old may require splinting in full extension for eight to 12 weeks. The splint is then worn for shorter periods that include nighttime splinting for six more weeks. Skin problems are common with prolonged splinting. 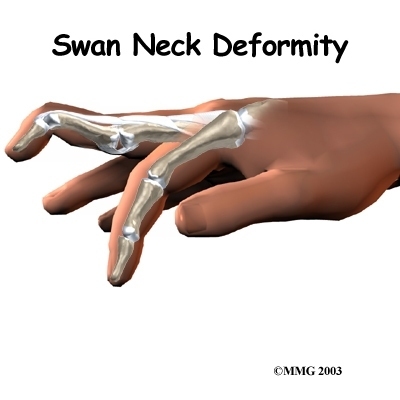 We advise that you monitor the skin under your splint to avoid skin breakdown. If problems arise, our Physical Therapist may recommend new or different splint. Nearby joints may be stiff after keeping the finger splinted for this length of time. Your Physical Therapist can design a program of Physical Therapy and exercise to assist in finger range of motion and to reduce joint stiffness. Rehabilitation after surgery for mallet finger focuses mainly on keeping the other joints mobile and preventing stiffness from disuse. Our Physical Therapy and occupational therapists can teach you home exercises to make sure your other joints do not become stiff. After the surgical pin has been removed, we may gradually introduce exercises to strengthen the finger and increase flexibility. At Grapevine Physical Therapy & Sports Medicine, our goal is to help speed your recovery so that you can more quickly return to your everyday activities. When your recovery is well under way, regular visits to our office will end. We will continue to be a resource, but you will be in charge of doing your exercises as part of an ongoing home program. Surgical treatment is reserved for unique cases. The first is when the result of nonsurgical treatment is intolerable. If the finger droops too much, the tip of the finger gets caught as you try to put your hand in a pocket. This can be quite a nuisance. 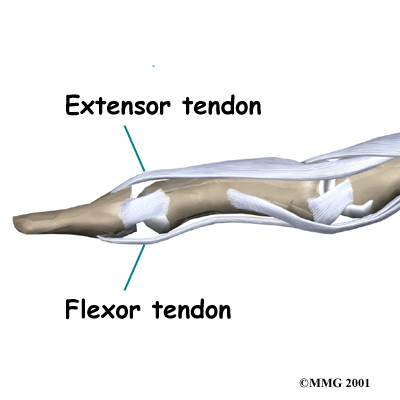 If this occurs, the tendon can be repaired surgically, or the joint can be fixed in place. 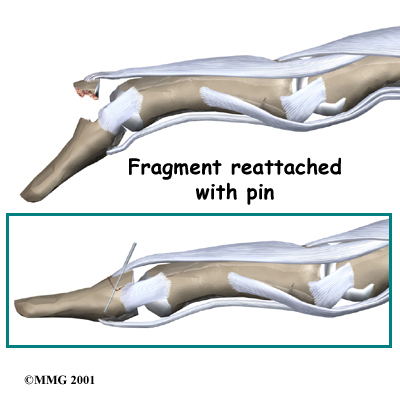 A surgical pin acts like an internal cast to keep the DIP joint from moving so the tendon can heal. The pin is removed after six to eight weeks. The other case is when there is a fracture associated with the mallet finger. 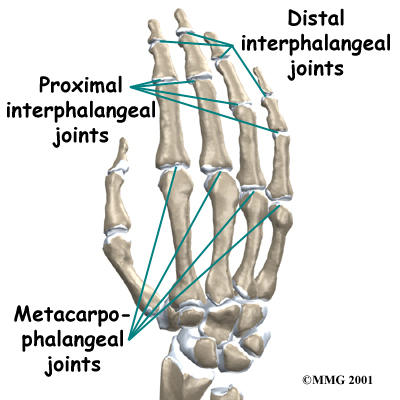 If the fracture involves enough of the joint, it may need to be repaired. This may require pinning the fracture. If the damage is too severe, it may require fusing the joint in a fixed position.